Crown Castle (NYSE:CCI) up 2.8%. SoftBank Group Corp., will reportedly call off negotiations to merge its subsidiary, Sprint Corp., with T-Mobile U.S., according to Nikkei Asian Review, a Japanese financial news agency. It said that SoftBank may approach T-Mobile’s parent company, Deutsche Telekom as early as tomorrow, to end the deal. It may soon be easier for towercos to use drones to assist them in activities like mapping and inspections. President Donald Trump directed the U.S. Department of Transportation and the Federal Aviation Administration to undertake an initiative to increase government and commercial use of drones. The Unmanned Aircraft Systems (UAS) Integration Pilot Program would enable safety tests and validate advanced operations for drones in partnership with state and local governments in certain jurisdictions. The program is designed to provide regulatory certainty and stability to local governments and communities, drone owners and operators who are accepted into the program, according to the U.S. Department of Transportation. New FCC Commissioner Brendan Carr is leading the agency’s efforts to streamline wireless infrastructure deployment. In his first speech as a Commissioner, Carr told attendees of the Competitive Carriers Association annual convention yesterday, the FCC intends to vote next month on several related orders. One eliminates the need for historic preservation review in cases where providers swap out utility poles that can hold antennas or other wireless communications equipment. This will go a long way towards helping carriers as they densify their networks in preparation for 5G, he said. In the first FCC oversight hearing with the full complement of five Commissioners, Chairman Ajit Pai told House lawmakers he’s asking his colleagues to vote on an item that would eliminate several broadcast ownership regulations. His goal is to vote on the item at the agency’s November 16 meeting. He said the item would eliminate rules that ban cross-ownership of newspapers and broadcast stations in a market, plus cross-ownership of TV and radio stations in a market. It would also eliminate the requirement that Joint Sales Agreements for Television “count” for ownership purposes in a market and establish an incubator program for new, diverse broadcast station owners. Inside Towers has been reporting the fight between Google and rural internet service providers versus large carriers over the licensing of the 3.5 GHz Citizens Broadband Radio Service (CBRS) spectrum. The FCC proposed increasing the size and length of CBRS licenses to use the mid-band spectrum; CTIA and T-Mobile petitioned the FCC for the changes. They want carriers to be able to use the spectrum for 5G. Small carriers and rural ISPs say the changes will crowd out other users — like them. The FCC voted to begin a Notice of Public Rulemaking yesterday, and proposed including longer license terms with the possibility of renewal and larger geographic license areas. Proponents said the modifications could help increase incentives for investment, encourage more efficient spectrum use, and promote robust network deployments in both urban and rural communities. Project Loon is now up and running in Puerto Rico, supporting basic communication and some internet connectivity. Google’s been working with AT&T, the Government of Puerto Rico, the FCC, FAA, FEMA, spectrum partners and international aviation authorities to make it happen. Residents with LTE-enabled phones can send and receive text messages and access information online, according to Alastair Westgarth, head of Project Loon. It’s the first time the technology has been deployed quickly. After this year’s incentive auction finished in April, the telecoms that acquired the 600 MHz spectrum licenses were expected to take up to three years to transition to the new frequencies. However, T-Mobile has already installed network sites broadcasting in the spectrum bands it purchased. The carrier acquired licenses to the spectrum between 617-652 MHZ and 663-698 MHz. It is currently operating in those frequencies in Wyoming and Maine. According to TVTechnology.com, T-Mobile plans to add more 600 MHz sites in Northwest Oregon, West Texas, Southwest Kansas, the Oklahoma panhandle, Western North Dakota, Coastal North Carolina, Central Pennsylvania, Central Virginia and Eastern Washington, before 2018. In an industry where change comes frequently, new equipment, improved procedures, climatic events and accelerated demand have all contributed in pushing a new set of rules forward in the industry standards and practices. Through the collaboration of the Telecommunications Industry Association (TIA) and American National Standard Institute (ANSI), those new standards have been revised and today will be made available to the telecommunications industry and reissued as the ANSI/TIA-222-H. Although the official announcement will be made later today, Inside Towers has been given an exclusive look at the new standards and permission, via TIA, to publish advanced access to the links to acquire the document itself. The cost of the ANSI/TIA-222-H is $750 and it can be purchased by following this link. In a joint venture with Australia’s Lendlease Group, SoftBank Group Corp. intends to buy approximately 8,000 cellular sites across the U.S. Lendlease will be the joint venture manager, asset manager and development manager. UPDATE Earlier this month, Inside Towers reported on California’s Senate Bill 649 proposed by Sen. Ben Hueso (D-San Diego), aiming to lower the build-out cost for wireless infrastructure, allowing more telecoms to enter the market and compete, specifically regarding small cells. The decision came down to Gov. Jerry Brown, who vetoed the bill late Sunday, reported The Mercury News. In a signing statement, Brown wrote that while he saw the value in “extending this innovative technology rapidly and efficiently,” the bill took too much control away from cities and counties. Of the 77 cell towers knocked out in the fires, all but eight have been restored, according to the California Office of Emergency Services. American Tower Corp. has been helping broadcasters with stations on its towers develop a repack plan. Of the 987 stations being repacked, the towerco has 218 licensees on 133 towers, according to James Stenberg, Principal Engineer, RF Broadcast for American. Federal agents from multiple law enforcement agencies are helping to restore communications in Puerto Rico and the U.S. Virgin Islands. Agents from the Drug Enforcement Agency, Postal Service and others worked with the Air National Guard and the Air Force to bring and erect at least five AT&T portable cell phone towers to the San Juan area, according to the Department of Defense and the carrier. Normally, the towers are trucked in to a location; this marked the first time the mobile cell towers were flown to a location in need, according to AT&T. The FCC granted an experimental license for Project Loon, led by Google’s parent company Alphabet, to help provide emergency cell service in Puerto Rico and the U.S. Virgin Islands. “More than two weeks after Hurricane Maria struck, millions of Puerto Ricans are still without access to much-needed communications services,” said Chairman Pai. 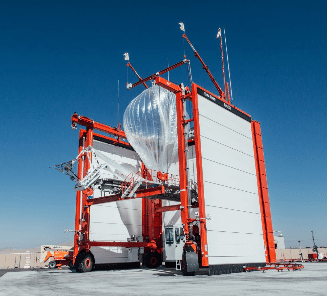 Project Loon is a network of balloons that provides connectivity to users on the ground. Pai called the approach “innovative” and said more such ideas are needed to restore connectivity on the island. Governors for Washington and Oregon said they will jointly issue a Request for Proposals (RFP) for potential alternatives to FirstNet, the broadband public safety communications network being built by AT&T. They plan to release the RFP this Friday, with bids due on November 13. Is FirstNet the Solution For Connecting Rural America? Several counties and municipalities oppose any sharing of the 6 GHz band used by their microwave systems. Los Angeles County, CA, the City and County of Denver, CO, Kansas City, MO, Ozaukee County, WI and the Government Wireless Technology & Communications Association jointly told the Commission they’re worried about interference with their public safety systems which consist of numerous tower sites.